With 10 years of experience towing cars, vans, trucks and 4-wheel drives, Southside Towing is always there for its customers when it needs them. Southside Towing is a licensed Towing Service. We get safety – meticulously adhering to procedures and protocols laid down by the RTA. Punctual, reliable, we turn up at the time we say we will. Safety means our priority is first getting your car off the road. It’s a dangerous place to be. Once we do that, we can tow it to your residence or if you prefer – a garage or mechanic of your choice. 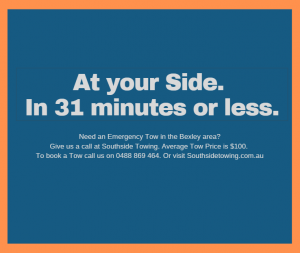 Located in Sydney’s South, Southside Towing remains one of Sydney South and Bexley’s favourite Towing Services. Responsiveness, and quick arrival on the scene when we receive a call for Emergency Tow Assistance, plus friendliness, courtesy and efficiency are what make more people call us every time their cars, vans or trucks break down. At Southside Towing, we understand an accident can happen any time of day or night. Therefore, we operate 24X7 X 365. Any time (God forbid) you may have a mishap, we’ll be ready and available to take your call. On average, we get to where our clients are in 31 minutes or less. Service is what people want most these days. And at Southside Towing, we excel at delivering it. We go out of the way – above and beyond to ensure our customers are happy with our work. Because we understand what gets us more business. Reputation – nothing more, nothing less. Our leadership is based on numerous factors. Chief among them – the Customer Surveys we regularly conduct. On average, customers whose vehicles we tow rate us 4.5 stars out of 5 for Customer Service. This, more than any other factor, is what has driven our growth. A customer-focused Towing Service, we try to understand our customers needs so we can better service them – all the time. Need an Emergency Tow in the Bexley area?